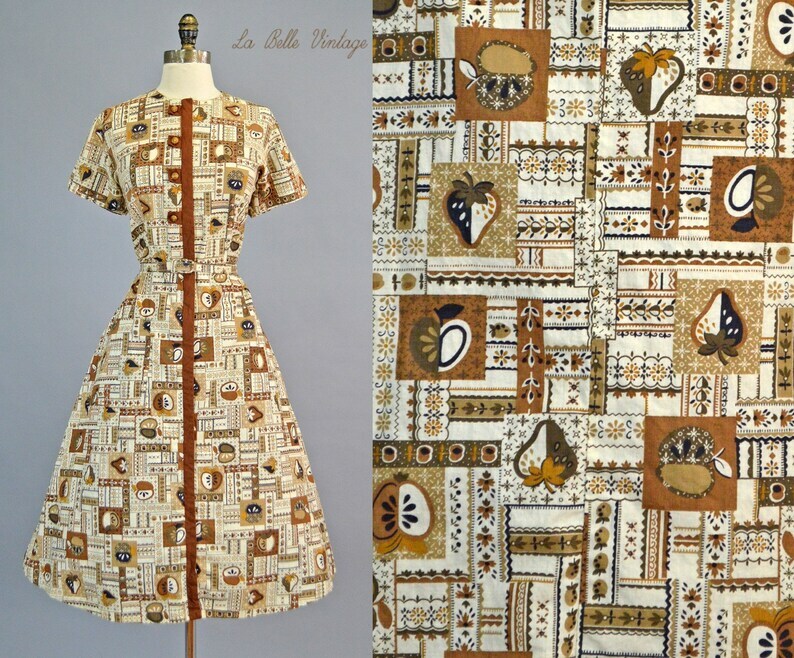 We are pleased to offer this cute dress from the 1950's by Top Mode Frocks. 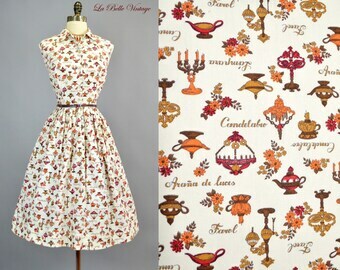 This dress is made of a lightweight Sanforized cotton broadcloth with a fun, colorful fruit print on a beige background. This features a round neckline with the front trimmed in brown piping an gold button trim. Close at the front with a long metal zipper and snaps. The set-in waist is fitted and has a self fabric belt. The skirt is very full with a patch pocket. Shown with a full crinoline for presentation. If you are unsure about the color of an item or the type of fabric, please do not hesitate to contact us. Please be sure to measure a dress that fits you well and compare these measurements with those. This is unworn and is near MINT condition with no wear. This has been professionally cleaned and will be wrapped in acid free tissue paper and packaged with the utmost care. ✂ Lay-away, Balance Parcel and Reservations are available. ✂ Like us on Facebook for updates, sneak peeks and coupons. What a fun playsuit, and I couldn't be happier with the fit! Well packaged, arrived smelling fragrant, and with a free belt (for which I am appreciative). Now I just have to figure out what I should wear for casual '40s hat and shoes. (I also appreciate that you took care NOT to pin thru the vintage fabric and sent a sale code for a future purchase.) Boy, I feel like this seller treated me like gold! I received this lovely dress yesterday. The pattern and color are as vibrant as pictured. I can't wait to wear it this summer! 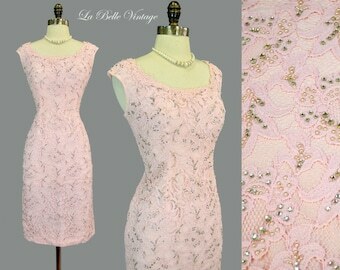 The seller was very accommodating and knowledgeable about vintage. It arrived beautifully packaged, like a gift. 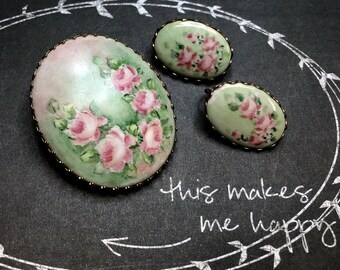 Speaking of which, my thanks for the lovely earrings that came with the dress. Unexpected lagniappe! US CUSTOMERS: We will accept payments through Etsy's Direct Checkout, Credit/debit cards through Square where we send you an invoice🧾, Paypal or USPS money orders. Return buyers can also pay with personal, certified or business checks or Western Union/Money Gram. Please contact me for prior approval if paying by money order. Money orders must be received within 6 days of purchase date. INTERNATIONAL CUSTOMERS: Payment is via Paypal or credit card only. We can also send you an invoice 🧾 through Square when you pay via credit/debit card. We do not accept international wire transfers, Western Union or international money orders. Also, we are not responsible for any customs fees & duties that your government may impose. Please note this before purchasing. We love to accommodate our customers so just drop us a line if you need us to hold an item for you. Items are reserved/held for a maximum of 48 hours. *Please note that an item can only be reserved/ put on hold if a deposit has been made. Also note that your item must be bought or paid off by the agreed due date. In the event of a cancellation or the item is not paid off by the due date, the deposit is non-refundable or transferable. We accept layaway/payment plans/balance parcel for items over $100. 1/3 of the total price (including shipping) is needed in order to place an item on layaway. Invoices are sent through PayPal or Square. * Individual items between $100-$200 are eligible for our 2 week layaway plan. * Individual Items valued at $200 or more are eligible for our 4 week layaway plan with equal payments made weekly. * Individual items valued at $500 or more are eligible for our 6 week layaway plan with equal payments made weekly. Sorry, we will no longer reserve items for lengthier periods of time and will not provide layaway for items under $100. Layaway is not offered on discounted or sale items. We are now accepting returns on shoes and wedding dresses made after 1940. Your purchase price will be refunded minus a 20% restocking fee. We understand that purchasing a wedding dress online can be difficult as you cannot see how you look in it. Wedding dresses that are returned must be unworn and in the same condition as sent with all shop tags attached and will be subject to a 20% restocking fee. Shipping costs will be paid by you and are not refundable. You are agreeing to this by purchasing a wedding dress from our shop. Antique and pre-1940s wedding dresses are not returnable due to the fragile nature of these items. *Shoes are returnable once in the same condition as sent. Shipping costs will be paid by you and are not refundable. We do not offer refunds on any other item in our shop besides wedding dresses and shoes. Please note this before buying. For all other items, we will accept returns in exchange for store credit in the amount of the purchase price of the item. This credit never expires. The item must be returned unworn with all shop tags attached and in the condition in which it was shipped. Please contact me within three days of delivery. Your item must be shipped back within seven days of delivery. If you need help in measuring an item or the details of an item like fabric, color etc, please do not hesitate to contact us. If you do not have a measuring tape, please contact us for a printable measuring tape. If you need help in measuring yourself or one of your garments for comparison, we'll be happy to help! International buyers are always welcome here and items are sent via USPS First Class Mail International for items under 4lbs (with size limitations) or USPS Priority Mail International. Domestic shipping is via Priority mail unless noted otherwise. Items are shipped within 72 hours of payment and are sent with delivery confirmation. A tracking number will be sent to you once item has been shipped. Express mail ships within 24 hours. We love to combine shipping! If your combined shipping cost seems off, please contact us before checking out to ensure that we have given the most cost efficient price for the shipment of your items. ✂ We will combine shipping costs on any items bought within the same week at any of our stores. Just let us know before purchasing so that we can give you a combined shipping quote. 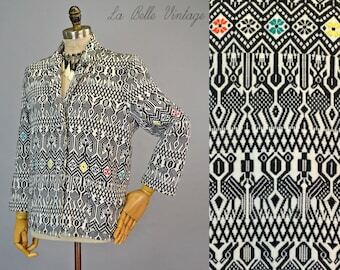 Vintage clothing is not new so it’s important that you understand the condition of a garment. On some occasions, you will find items that have not been worn which are deadstock or new old stock (NOS). But, for the most part, vintage has been previously worn. MINT: An item is as perfect and pristine as when it was originally made and shows no sign of wear (mint condition is rare for vintage clothing). **Please note that Mint Unworn/Deadstock/New Old Stock items may sometimes have storage marks (due to age/elements) on the fabric. This does not constitute as "wear" as the item was never worn. NEAR MINT: An item shows only the slightest signs of wear. EXCELLENT: An item shows typical signs of wear due to occasional use. VERY GOOD: An item is considered wearable but has some surface flaws (staining or soiling, for example). GOOD: An item is wearable but cannot be returned to excellent condition even if repairs are made. Of course, the older a piece of clothing is, the more likely it will display indications of its age. Signs of wear should be expected. Although condition ranks as a main buying consideration for vintage clothing, it’s not as crucial for older items. ✂ IS MY DRESS CLEAN? Items are always sent to you in a ready to wear condition. "Estate fresh" garments are never in ready to wear condition so that means we take the extra time/care to either carefully launder and iron our items, steam, press or have them dry cleaned before sending. The only garments that we do not clean are deadstock/new old stock garments that have not been worn. Collectors prefer these in "Estate fresh" condition. However, if you purchase a deadstock item from us and would prefer it cleaned before sending out, just let us know. There is no charge for this...just request this. Items are stored with cedar and lavender sachets to keep away moths etc. Please do not purchase if you are allergic to any of those. If you are also allergic to moth ball odor, "old clothing smell" or "old lady smell", you should not be purchasing vintage...period. Although we clean every item before listing, vintage clothing has had a life before reaching to us and we cannot be held responsible for your allergic reactions. Doing a vintage film, play, photo shoot or ad? We may have just what you need. We have special discounts for large orders or on set credits. No rentals though! All materials which contain "labellevintage" and its subsidiary sites are protected by United States and United Kingdom copyright law and may not be reproduced, distributed, transmitted, displayed, published, or broadcasted. 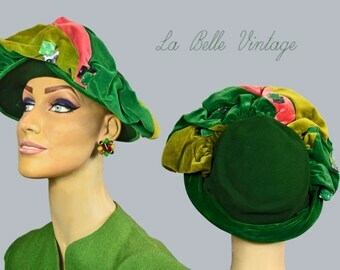 No company or individual has any authorization to use our brand name, photos or logo "labellevintage"
"labellevintage" is a registered trademark of the La Belle Vintage Inc of the United States and may not be reproduced in any form or fashion. Parties that use our logo, photos etc without written consent will be subpoenaed to appear in court for copyright infringement and can be charged or fined for internet fraud. *** So, you've reached the end...YAY! Thanks for reading. We're glad that you took the time. We know it was lengthy..but at least you know what we're about. All items are accurately described and measured. Items are measured flat, then doubled. Also, do note that custom made vintage clothing, especially home-made dresses were made to fit a particular body shape so alterations would be expected. Items are always sent to you in a ready to wear condition, unless they are deadstock/ new old stock. Cleaning deadstock items decreases its value therefore we leave it up to the buyer to do this. Instructions for cleaning are included when requested. We either carefully launder and iron our items, steam, press, professionally clean or have items dry cleaned before sending. We are happy to include care instructions upon request. All clothing items sold in our shops are wrapped in acid free tissue paper and then further gift wrapped for presentation. Fragile items are wrapped in tissue paper, then further wrapped in bubble wrap. We use packing peanuts and air pillows as fillers/padding. If you would prefer Eco-friendly packing, please request before making a purchase. May I Reserve an item? We love to accommodate our customers so just drop us a line if you need us to hold/reserve an item for you. Items are reserved for a maximum of 48 hours. Please note that an item can only be reserved if a deposit has been made. Also note that your item must be bought or paid off by the agreed due date. In the event of a cancellation or the item is not paid off by the due date, the deposit is non-refundable or transferable. Vintage clothing is not new so it’s important that you understand the condition. **Please note that Mint Unworn/Deadstock/New Old Stock items may sometimes have storage marks (due to age) on the fabric. This does not constitute as "wear" as the item was never worn. Items are sent to you in a ready to wear condition. "Estate fresh" garments are never in ready to wear condition so that means we take the extra time/care to either carefully launder and iron our items, steam, press or have them dry cleaned before sending. We NEVER use items such as Febreeze or Dryel as those are not cleaning agents. They are only used to mask odors and will leave dirt and residue in your vintage garment. We will combine shipping costs on any items bought within the same week at any of our stores. Wedding dresses that are returned must be in the same condition as sent with all shop tags attached and will be subject to a 20% restocking fee. Shipping costs will be paid by you and are not refundable. You are agreeing to this by purchasing a wedding dress from our shop. For all other items, we will accept returns in exchange for store credit.